for the first time in over 30 years. All of this was be so incredibly wonderful that we thought nothing could top it until now. TedShred and I actually kicked off with a Washington Square Jam on Wednesday. We had just broken a sweat when the original Bud Light Team came walking up. That’s right, The Oracle arrived with Chipper-Bro Bell and Crazy John in tow. The former was our official A*TGJI invitee while the latter showed up as a complete surprise. In fact, when Chipper got to Joey’s house, he asked for help with his bags. When Joey got to the back of the limo, the driver popped the trunk and Ouila! There was Crazy John. Those guys joined ted and I in the Jam and just a few minutes later Mark RegalBUTI comes strolling through. We all shredded and then went to the House of Oberhaus for Marghies and Chinese. And now for the main course. already gone way passed 11 on the scale and I can only share a few highlights. got a smoking Jam in with Alan Caplin and Larry Laerbs Imperiale who made a bid to be the first out of town Gamboa winner when he hit three consecutive scarecrow brushes with each as sweet and flat as could be. There were too many combinations to write down them all , so please forgive me. Flow-meisters, Fresh filling in every gap, and TO as the featured soloist who just crushed everything in or out of his range. This one truly may just be the best combination I have ever seen, particularly since there was no tournament attached to the event. Per Quinn-O: After Ted hit a double spinning, beautifully timed barrel, I saw Krae put his hand to the side of his face and shake his head slightly. The Ultimate compliment. 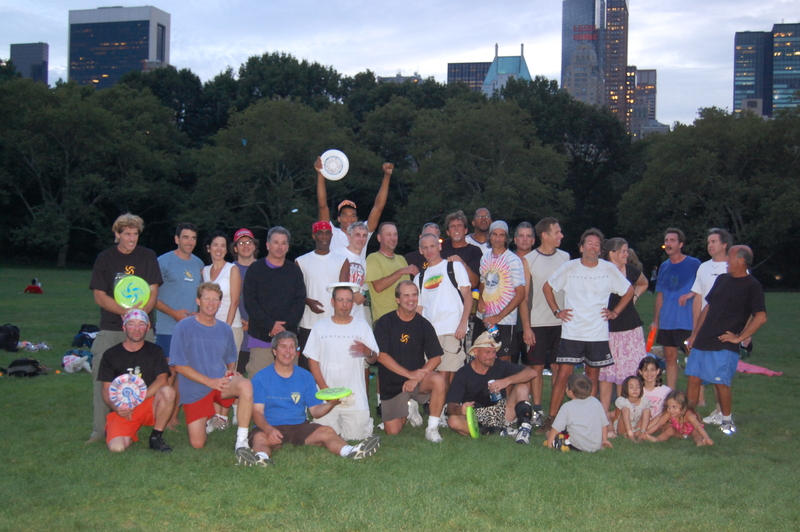 After being wowed by the plethora of heinous guest players, I say here’s to the home-grown NY jammers. The party afterwards at Chez Meier was just as Hein as the Jams too. This was surely the greatest gathering of talent that the Hard Corps of the Big Apple has ever hosted. So when are YOU Comin’ Down??? ?